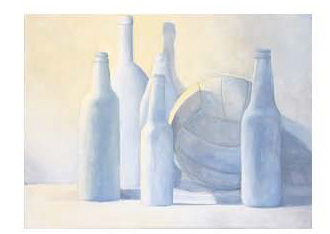 Assignment:Make a composition of a stillife of white objects from direct observation. Be sure to set up an asymmetrical composition with a variety of shapes, sizes and placements of your objects. First sketch out the composition with charcoal on canvas. Include shadow shapes wherever possible. Vary the whites to include warm tones and cool tones. Pay attention to reflected light in shadow areas. Be sure you are pushing the white from dark to light, and that the final surface of your painting has interesting and varied texture.